For someone who loves cooking and eating Asian-style stir fries, it’s a wonder I’ve made it this far without a wok. I’ve just been using my stainless steel frying pans for stir frying. I mainly choose stainless steel because it’s not coated in Teflon, or other questionable material, that flakes off so easily. I’ve never been able to keep one of those Teflon-coated pans free of scratches! So I knew I never wanted a wok coated in a strange material, and woks made from other materials, like cast iron, were just too expensive. And so, I just never had a wok. But during a “window-shop” at Kitchenware Direct one day, I noticed they had stainless steel woks. Oh! I didn’t even know such a thing existed! And the one I liked was actually compatible with induction stovetops! Perhaps it was time for a wok, after all. A Scanpan Impact 32-cm stainless steel wok, to be exact. And it matched the rest of my Scanpan Impact cookware. Brilliant! Brad Russell, from Kitchenware Direct, was happy to send me this wok, along with a couple of other products, to test out and review. But first let’s talk about the wok. It’s from the Impact range of Scanpan’s stainless steel cookware and looks beautiful in any kitchen. The thick stainless steel base of the wok sandwiches a 5mm aluminium core which provides even, steady heating on all cooking surfaces, including my induction stovetop! I love my Scanpan cookware and take great care of each pan. 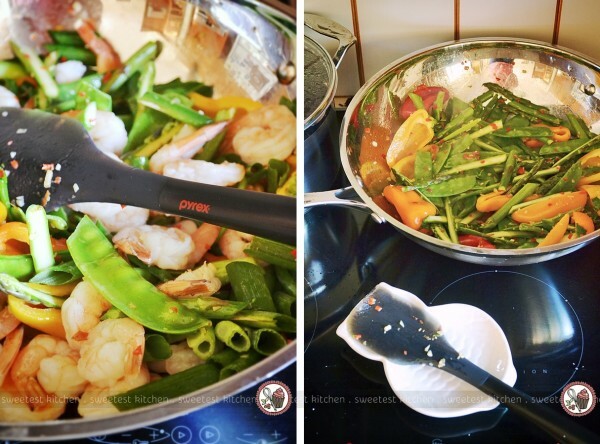 This wok is the perfect addition to my Scanpan family! I chose to make a healthy and nutritious stir fry to break in my new pan. On one side of the stove, a pan to cook black rice. On the other side, a wok to cook the veggies and prawns. What I love about induction cooktops is how fast they heat up. In no time, the wok was ready to go. Stainless steel cookware can be a little tricky to cook with, especially if you’re used to non-stick cookware. The very first thing I learned with stainless steel, is when cooking with meat, get the pan to the right temperature, add the meat to the pan and leave it. Don’t try to move it or turn it. There’s a “magic moment” when the meat will actually release itself from the pan, telling you that it’s ready to be turned. But, first up, your pan needs to be at the right temperature; if it’s too low, you might find your food will stick. The same goes with the food you add to the pan; if the food is too cold, it might stick. Let any cold foods come to room temperature before adding them to the pan. There are so many tips and tricks out there for using stainless steel pans! I could go on and on. But if you’re interested in making the switch, or just simply don’t know how to use stainless steel cookware, just search online for help. So this stir fry. While the rice was cooking, I cooked some prawns – in two batches, so as not to cool the pan down. I was very pleased with how well the prawns cooked and I felt very professional cooking in a wok for the first time ever! Now I’ll introduce the second product from Kitchenware Direct to talk about – the Pyrex silicone spatula. I have been in dire need of a new spatula. I normally use wooden or bamboo ones, but I kept having to throw them out after a while (or I’d find one of my cheeky children had drawn on them with a marker to make a spoon animal!). I just wanted a spatula I could keep around for a while and chuck in the dishwasher for once, and it had to be flexible so it could actually scrape out all the little bits from the corners of the pan. The Pyrex spatula could do all that. 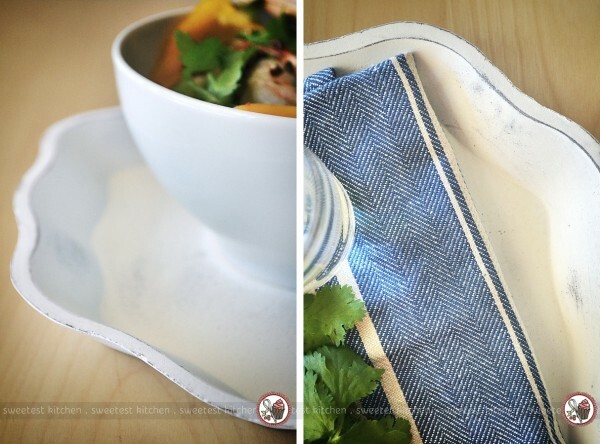 It’s heat safe up to 260C, dishwasher safe, resistant to stains and odors and is BPA-free. Perfect! The handle of this large 30cm spatula is slightly weighted and ergonomic, making it easy and comfortable to use. Flexible edges allow you to reach in the corners of any shape of pan to scrape out every last bit of batter, scrambled eggs, etc. However, I thought the flexible edges were just a little bit too flexible/flimsy to scrape out any bits of food that happened to be stuck to the pan. Otherwise, it’s a very useful spatula and I know it’ll get heaps of use in my kitchen. Last, but certainly not least, is this gorgeous Nel Lusso hand-painted wooden tray. The very second I saw this, I was in love. It’s designed to look rustic and vintage. While it is very pretty, there are some drawbacks to using this tray. 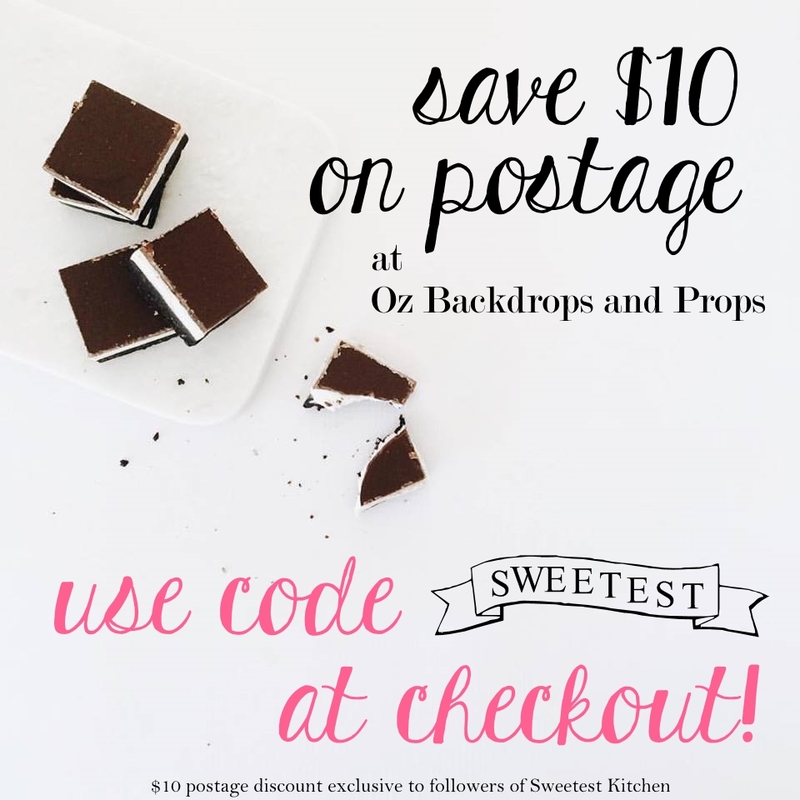 You’ll need to avoid direct contact with food, as certain types of food can stain the paint. You can’t just stick this tray in the dishwasher, or submerge it in a sink of water to clean it; a very lightly damp cloth and gentle spot-dabbing will hopefully do the trick, if you should ever get food on it. And finally, be gentle with it! Any knocks to the edges, and dents will easily form, making the paint flake off. While it’s definitely not for every day use, it makes a beautiful prop for food styling and you can count on seeing this tray in many upcoming posts! Now, just a short bit about this prawn and asparagus stir fry with black rice. This is a quick and easy recipe, perfect for dinner any night of the week. 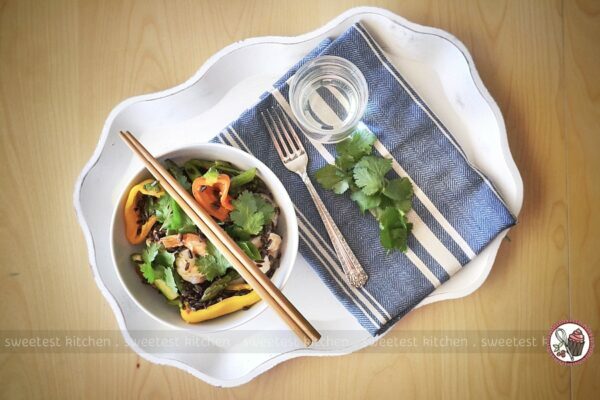 With fresh vegetables, prawns and nutritious black rice, it’s light and healthy. This is the first time I’ve ever cooked with black rice and it was a very interesting experience! When cooking with black rice, you absolutely need to rinse it 4 or 5 times. You’ll notice the water will turn a dark purple color, which is due to the high amount of anthocyanin (antioxidants which fight cancer and heart disease) found in black rice. In fact, it’s believed that just a spoonful of black rice contains more health-promoting anthocyanin antioxidants than are found in a spoonful of blueberries, making black rice the new “superfood”. The smell of black rice is rather odd. When I first started smelling it, I didn’t realize what it was. It was quite a nutty smell and eventually I realized where it was coming from! The entire kitchen was filled with this smell and I didn’t like it; I had to open some windows! I began to fear I wouldn’t like the taste of the rice. Not to worry, however, because I did love the taste of it. Quite different than white rice, black rice had a mild, nutty and sort of earthy taste that complimented the stir fried vegetables and prawns really well. Thank goodness it didn’t taste anything like what it smelled! Black rice can also be used in sushi and desserts as well, so it’s quite versatile. 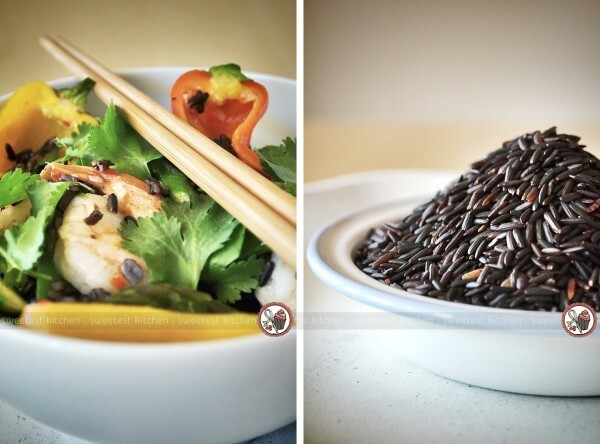 Have you tried black rice before? 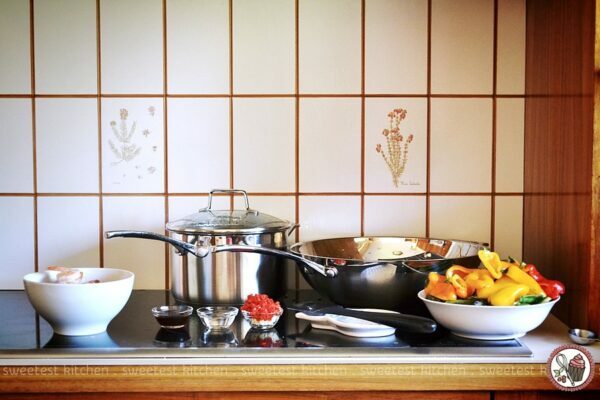 And what type of cookware do you cook with? Do you swear by stainless steel, like I do? 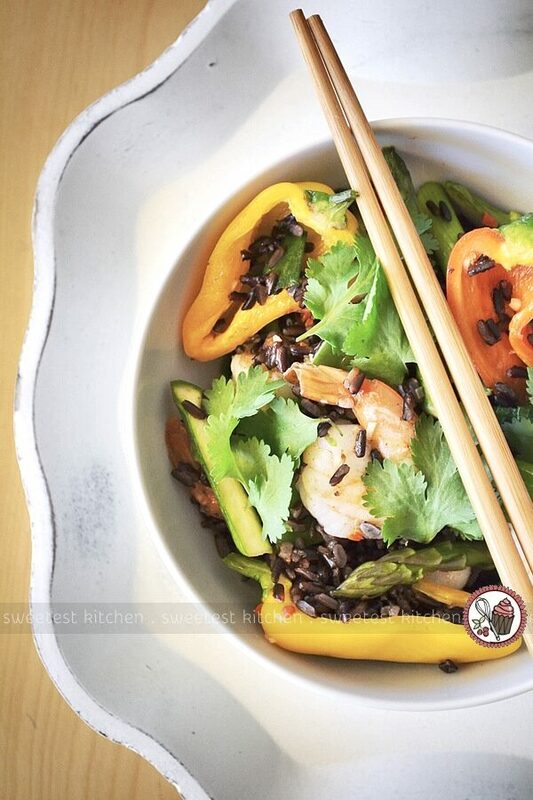 A light and fresh prawn & asparagus stir fry with nutritious black rice. Cook rice in a large saucepan of boiling water for 25 minutes or until al dente. Drain. Meanwhile, heat half the oil in a large wok over high heat. Stir fry the prawns, in batches, for 2 minutes or until golden and just cooked through. Transfer to a bowl. Stir fry garlic and chili over high heat for 30 seconds or until aromatic. Add asparagus, peas, capsicums and water. Stir fry for 2-3 minutes until vegetables are tender crisp. Add rice, shallots and prawns to wok and stir fry to combine. Add the soy sauce and wine. Stir fry for 1-2 minutes or until heated through and well combined. Serve and sprinkle with coriander leaves. I have that spatula too! I use it mainly for baking as I find when you use it with hot foods it does get really flexible. This stir fry looks so yummy! I’m actually a non stick girl since I can’t have oil and it makes it so much easier for me to cook!